Olay Cleansing Infusions Body Wash- 1.7 oz. Micro-scrubbing infusion with crushed ginger gently exfoliates while cleansing, for healthier, radiant-looking skin. No7 Early Defence Glow Activating Serum- 1.0 oz. Unique technology boosts skin’s natural renewal process helping to clear and refine pore, for a radiant complexion after one week. St. Ives Collagen Elastin Moisturizer- 2.0 oz. 100% natural moisturizers work to improve skin’s elasticity, visibly reducing the appearance of fine lines and wrinkle in just 7 days. Pantene Foam Conditioner- 1.4 oz. In-shower conditioner contains air-light microbubbles that strengthen, moisturize and bring shine to every strand without weighing hair down. Clairol Color Crave Hair Makeup- 1 ct. Shake. Shimmer. Dry. Go- temporary hair makeup instantly adds a little luxe to your locks and is visible on every hair color! Wet N Wild Color Icon Eyeshadow Quad- 1ct. Enriched with macadamia oil, providing crease-resistant wear and continuous moisture to the delicate eye area. Nexxus Dry Shampoo- 1.15 oz. Lightweight, fragrance-free formula brings volume and texture back into strands allowing you to go a day (or two!) longer without washing hair. 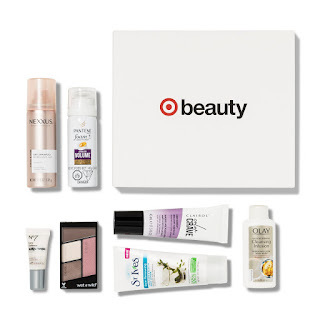 $3 off your Beauty Purchase of $15 or more. Applies to cosmetics, skin care, and hair care purchases. Expires 4/8/18. See coupon for details. Plus, if you're a Target REDCard holder you will get an extra 5% off making the final cost of each box just $6.65 shipped.